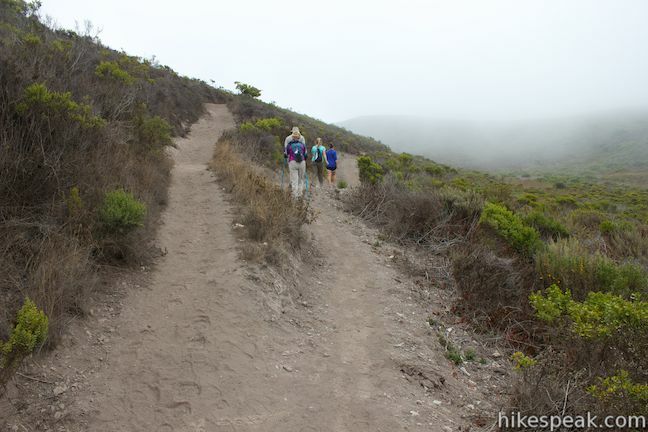 Montaña de Oro State Park has every type of hike you could want, ranging from easy oceanfront strolls to difficult summit ascents. 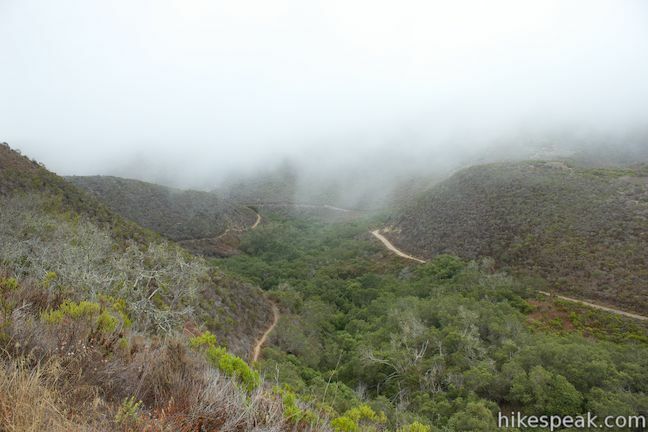 If you’re feeling like Goldilocks and want something in the middle (just right), check out Reservoir Flats Trail, a 2-mile loop with 200 feet of elevation gain that is conveniently located just behind the park visitor center. 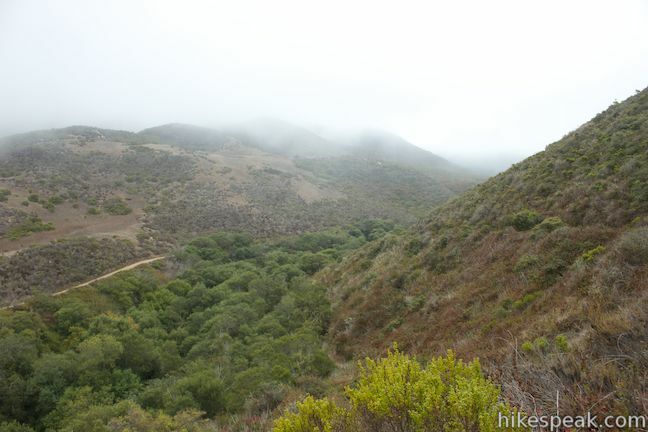 The trail travels around the bottom of Islay Creek Canyon above Islay Creek Campground, delivering a variety of views looking down toward the nearby coast and up into the Irish Hills. 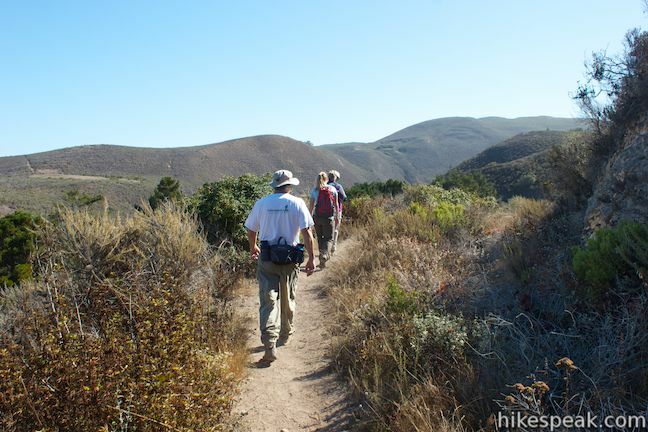 The hike begins from a trailhead between Islay Creek Campground and the park visitor center in Spooner’s Ranch House. 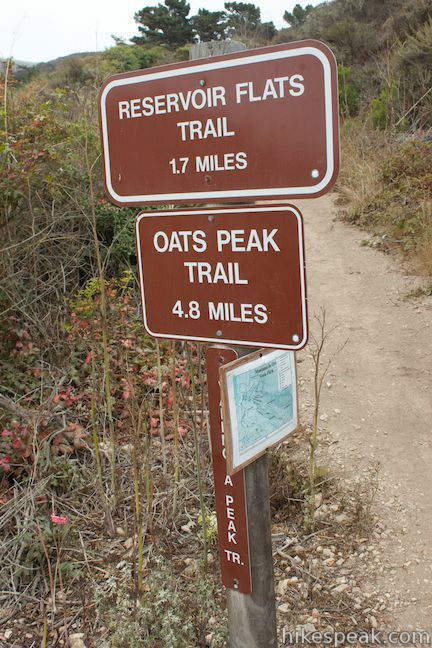 There are signs for Reservoir Flats Trail and Oats Peak Trail at the trailhead as the two hikes cover the same ground for the first 0.3 miles. 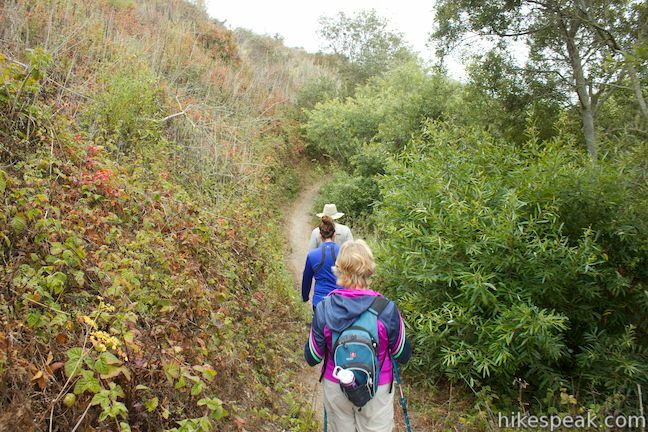 On this opening leg, you will ascend the south side of Islay Creek Canyon, gaining an overview of the 50-site Islay Creek Campground. 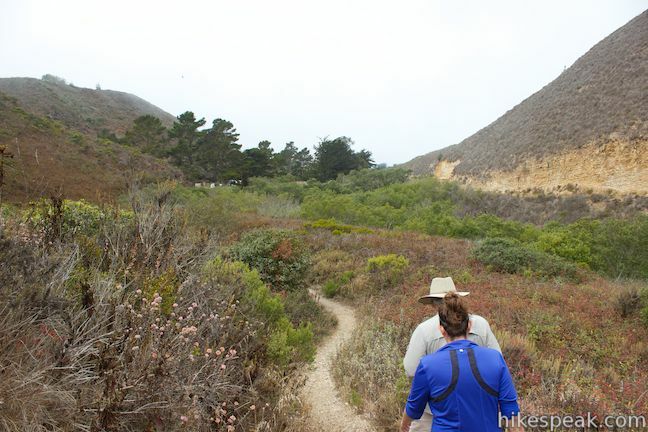 Look back down the trail to see the bluff-framed beach called Spooner’s Cove at the bottom of Islay Creek Canyon, backed by the blue water of the Pacific Ocean. 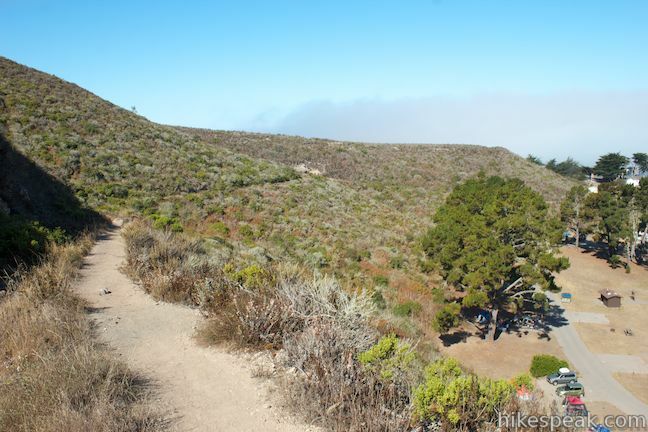 At 0.3 miles from the start, you will reach the first trail junction, which is also the most critical. 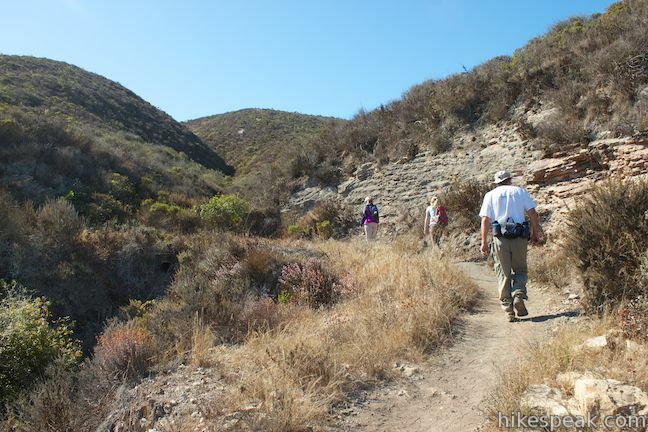 To the right, Oats Peak Trail continues to ascend toward Oats Peak. 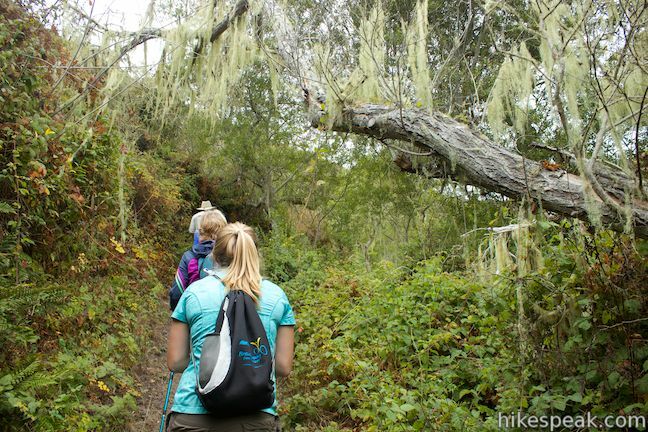 Save that longer hike for another day and turn left onto Reservoir Flats Trail. 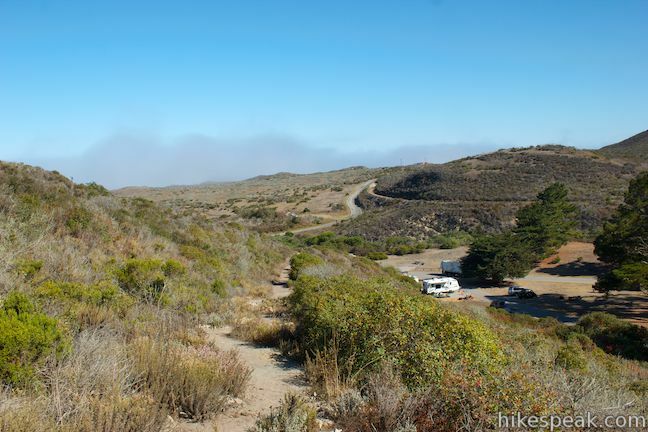 Reservoir Flats Trail makes its way out to a flat area on the canyon wall that is perched above the campground to offer a fine perspective back down toward the coast. 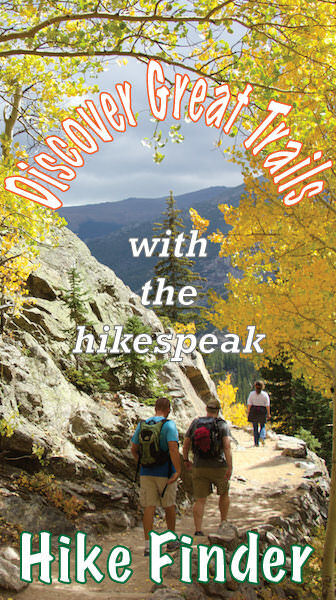 Next, drop across a depression that held the small spring-fed reservoir that this trail is named after (a handy asset for the former residents of Spooner’s Ranch House). 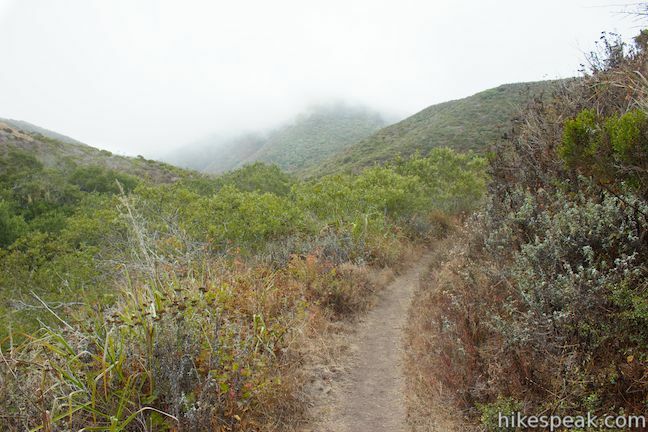 The trail crosses the bowl to the foot of a small hill standing in the middle of Islay Creek Canyon where you will reach a second junction, a tenth of a mile from the first one. 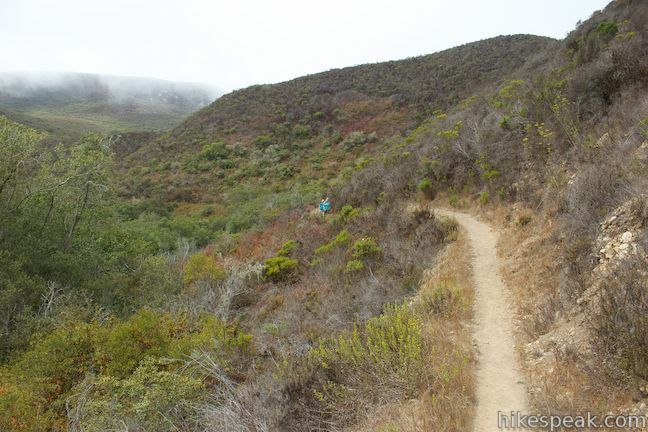 This is a split between old and new segments of Reservoir Flats Trail. 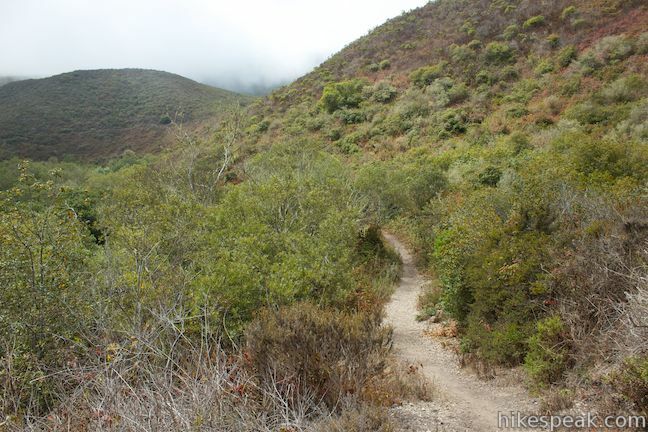 Old Reservoir Flats Trail parts to the left, ascending a switchback to cross the top of the hill. 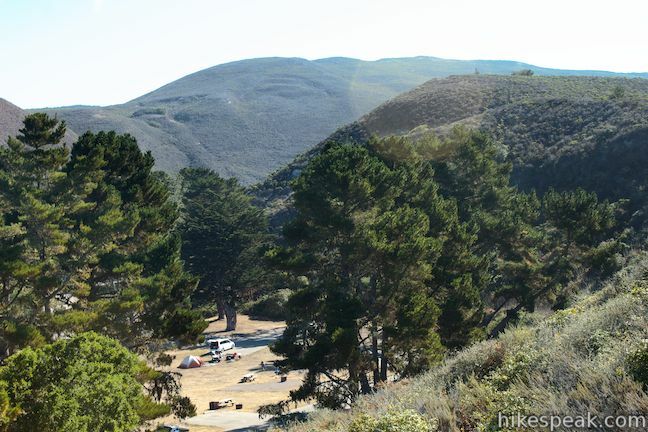 New Reservoir Flats Trail heads to the right on a more level course across the miniature valley between the hill and the canyon wall. 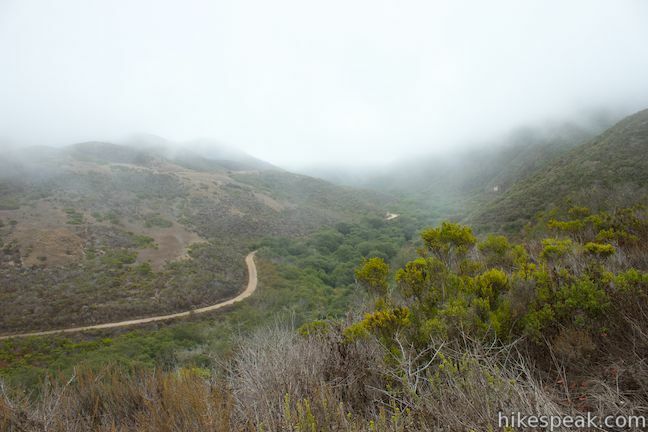 If you turn right and follow the new trail, you’ll hike an easy quarter mile to another junction where the trails come back together. 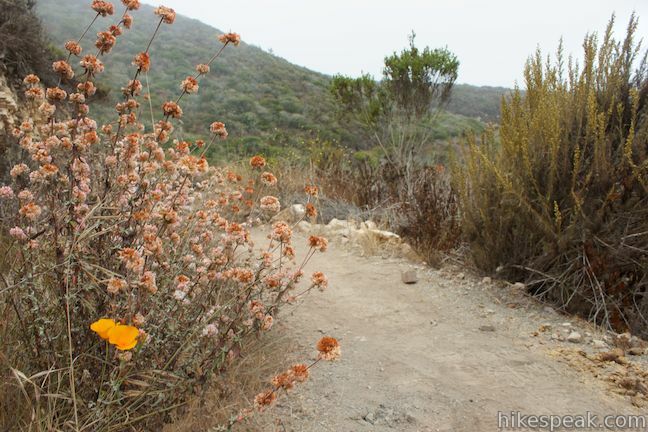 Turn right to continue with the loop. 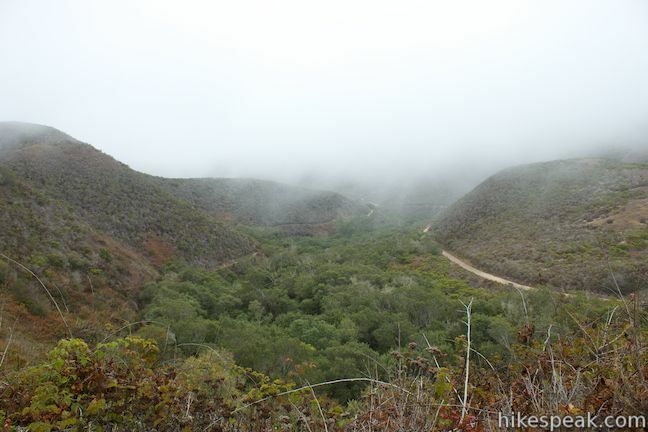 From the reunion of old and new Reservoir Flats Trail, follow the unified trail east deeper into Islay Creek Canyon. 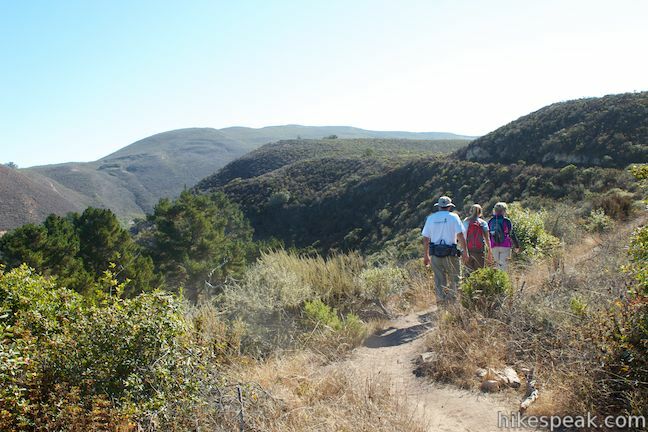 The trail turns downhill to offer views across the canyon from the canyon wall. 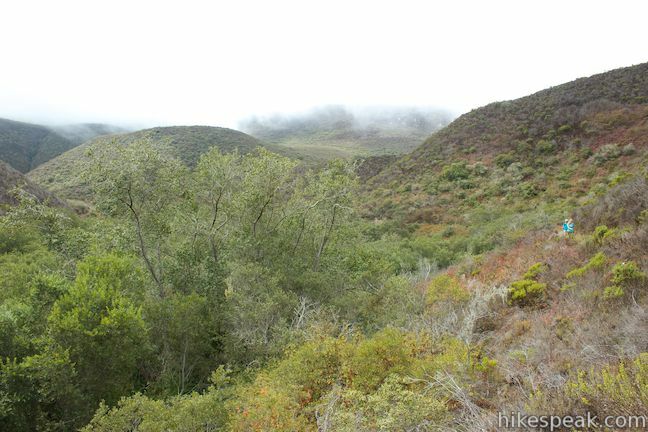 Cottonwoods line the bottom of the canyon and you’ll spot Islay Creek Trail on the far side. 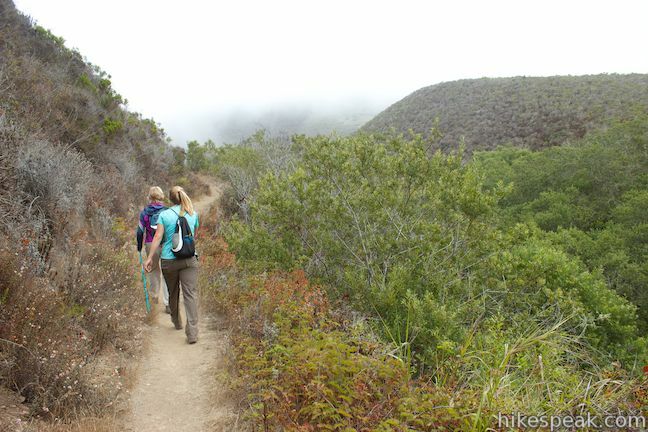 You won’t hike all the way to the bottom of the canyon, but close. 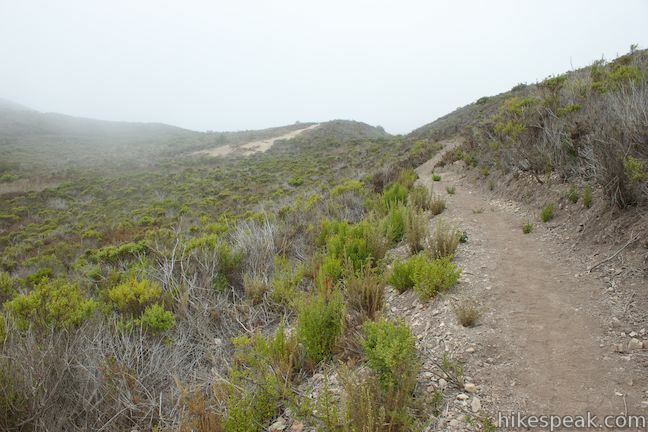 After another quarter mile (0.9 miles from the start), you will reach another junction. 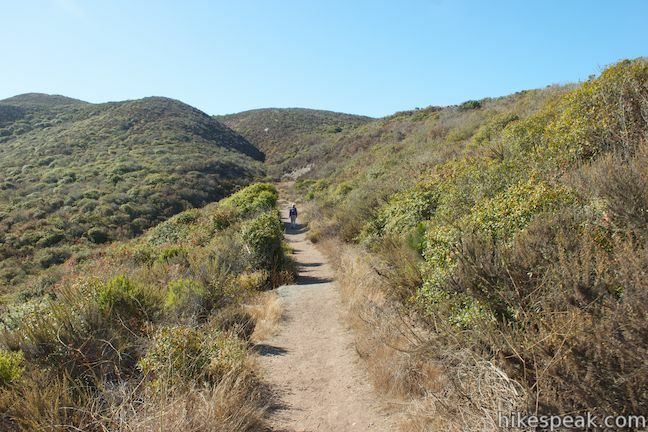 To the right is a connector trail to Islay Creek Trail, which you could use as an alternate return route if you want to hike a little farther. 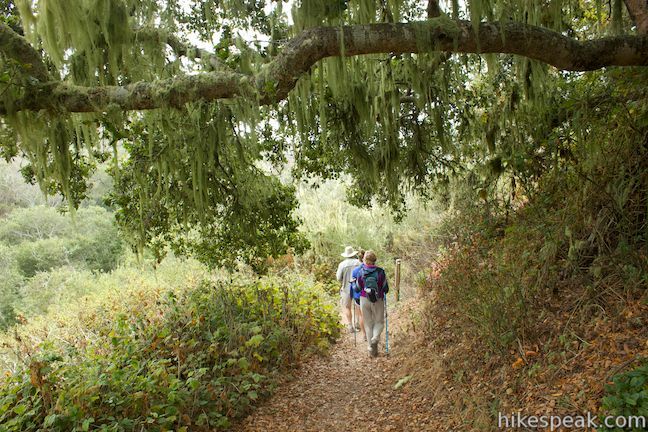 Make the sharp left turn to continue on Reservoir Flats Trail toward Islay Creek Campground. 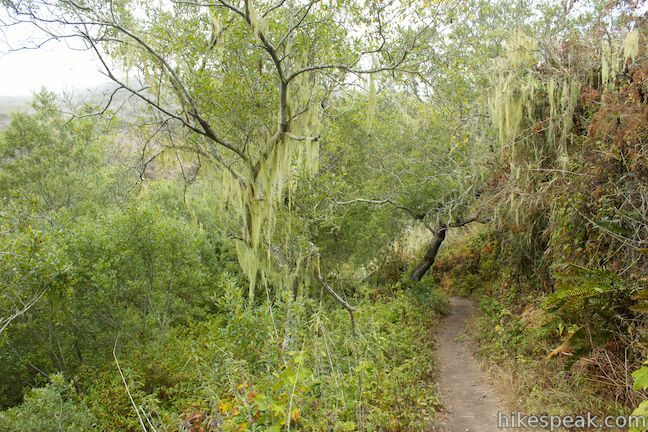 Reservoir Flats Trail makes its way along the side of the canyon, passing through tall brush and clusters of oaks decorated with lace lichens that hang from tree branches like tinsel. 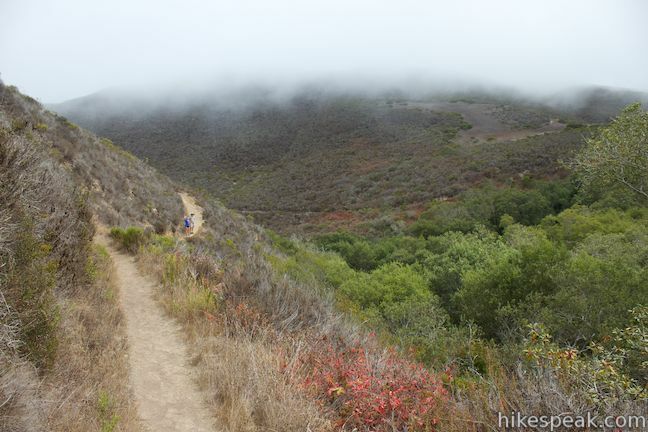 There are views up and down the canyon as the single track rounds a bend in the canyon above the creek. 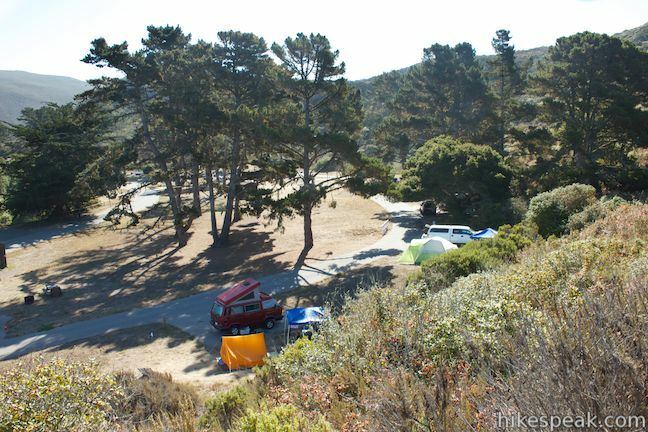 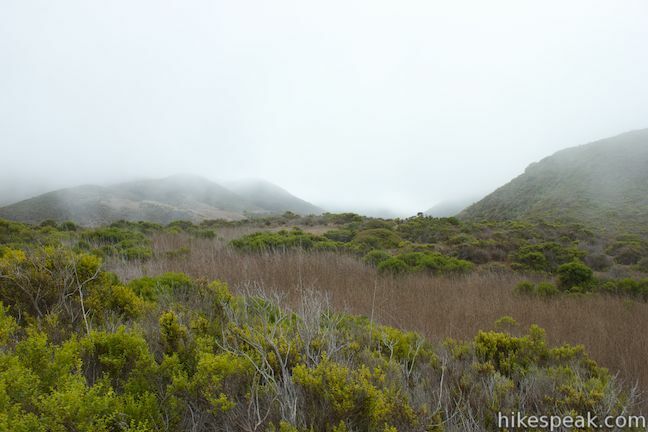 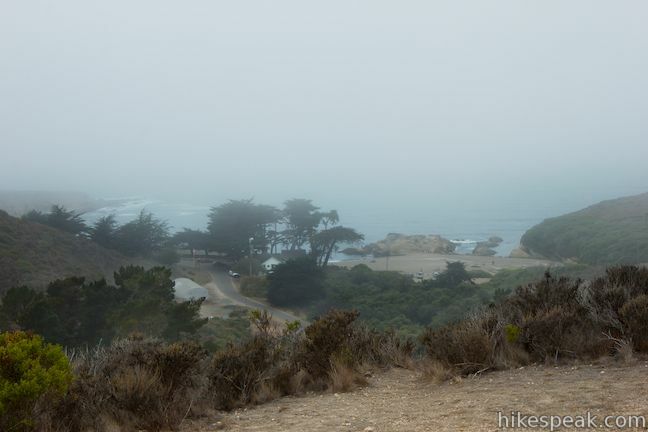 After another 2/3 of a mile (1.55 miles from the start), you will reach the edge of Islay Creek Campground. 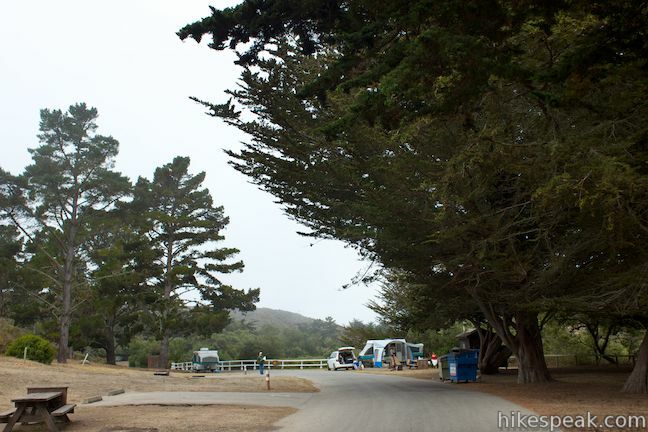 Walk straight down the road through the campground to return to the trailhead where the hike began. 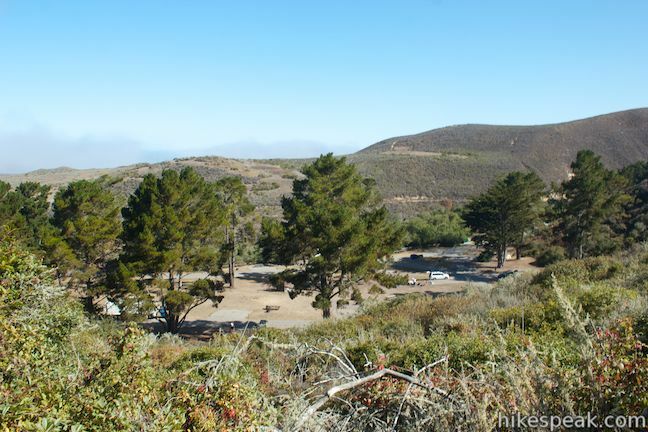 Just after the campground’s second loop, you will angle uphill toward the Spooner’s Ranch House and spot the trailhead on the left. 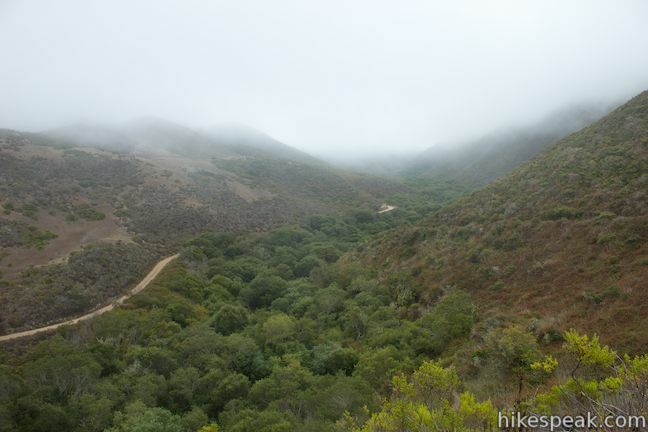 People camping at Islay Creek Campground may find it convenient to hike this loop in reverse. 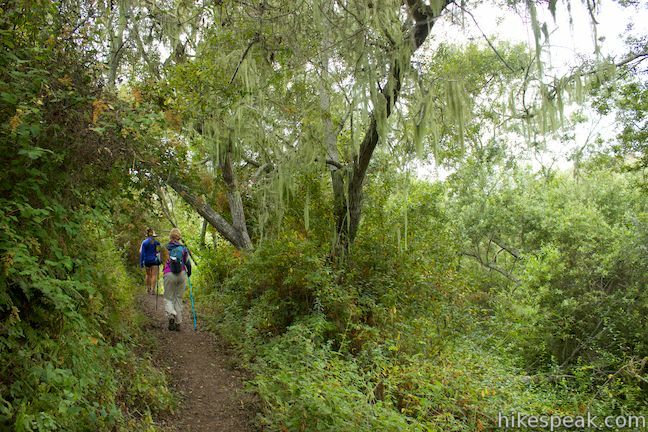 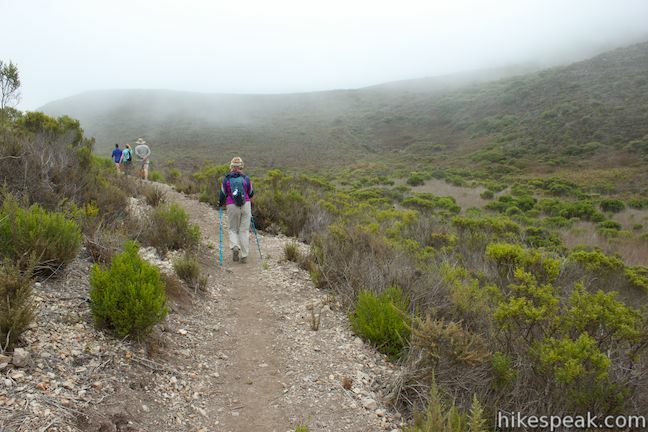 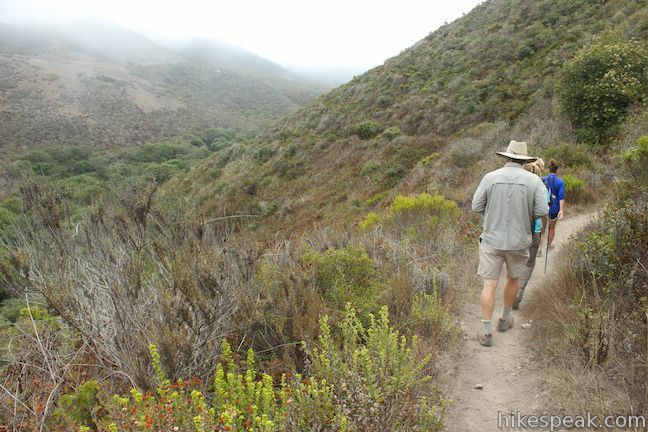 Campers can also use Reservoir Flats Trail to reach Islay Creek Trail to hike farther up Islay Creek Canyon. 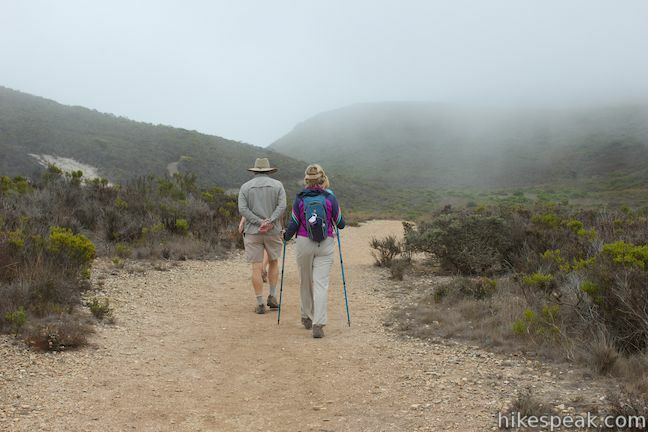 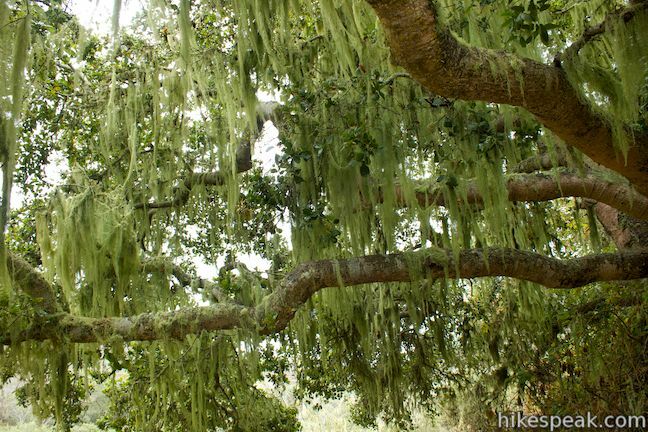 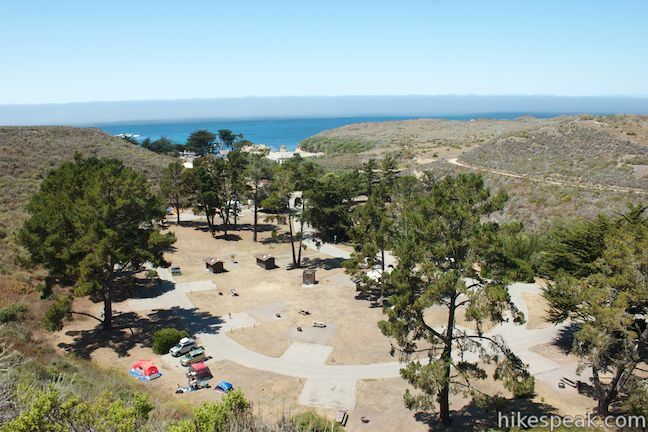 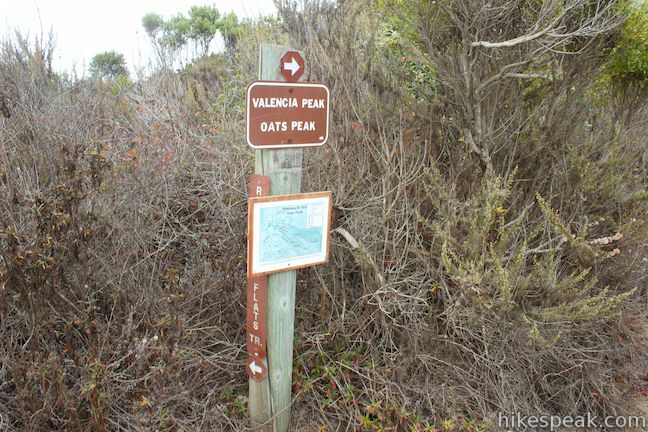 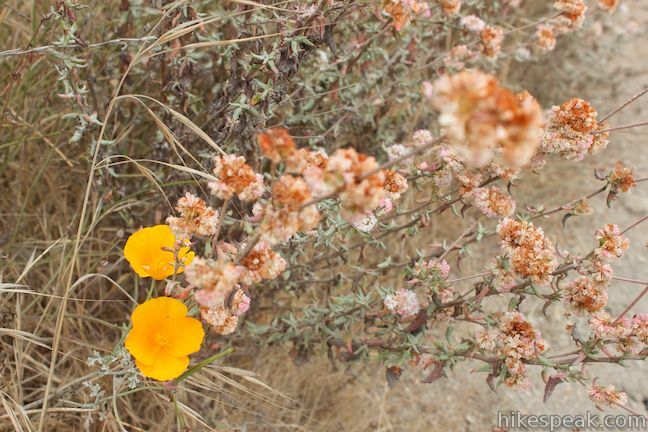 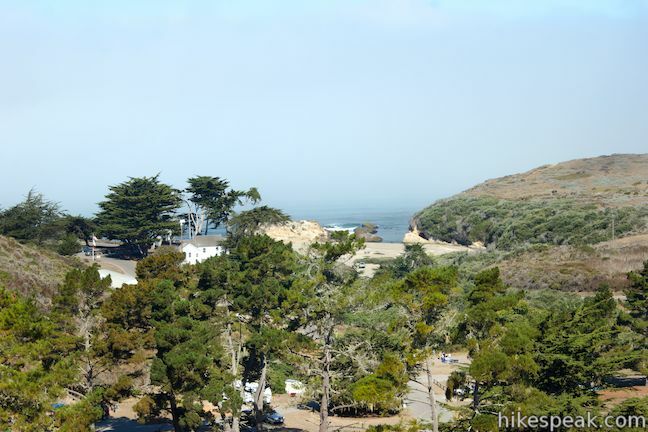 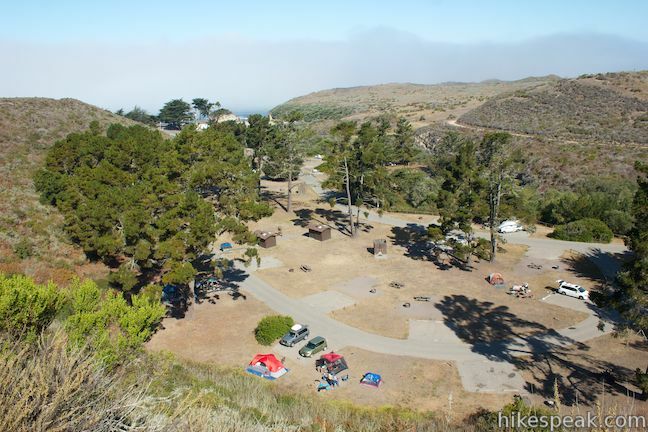 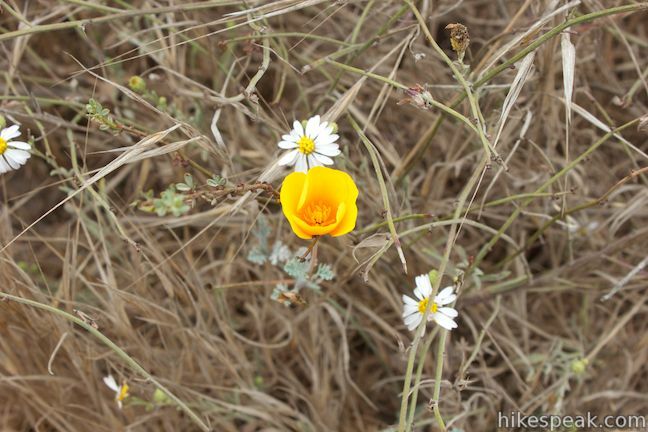 No permit is required to hike Reservoir Flats Trail and there is no entrance fee for Montaña de Oro State Park (although there is a fee to camp at Islay Creek Campground). 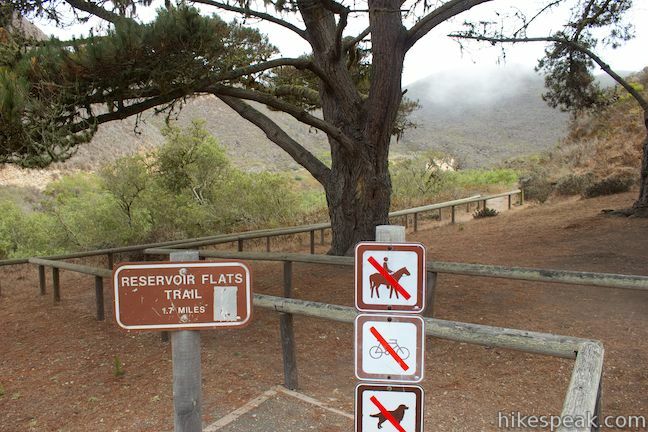 Dogs are not allowed, but the trail opened to horses and bikes in March of 2014. 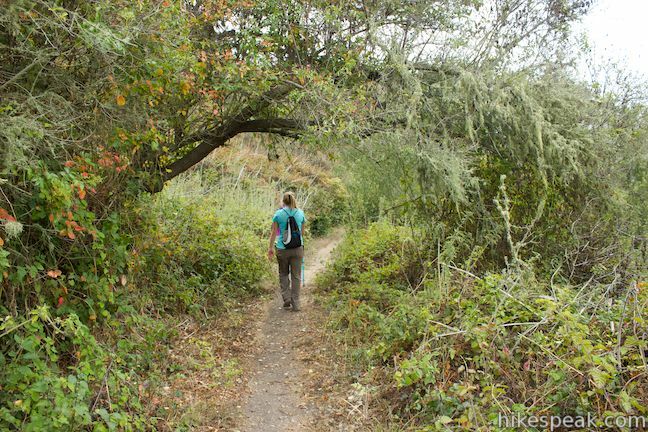 Wear long pants and watch out for poison oak along the trail.